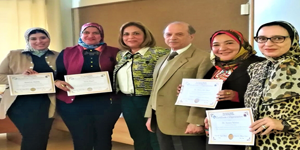 Under the auspices of Prof. Ezzat Hassan El Grately, the Dean of the faculty of Allied Medical Sciences and Prof. Mervet Ossman, the Vice Dean, the first scientific forum was held on Tuesday, 26 February, 2019. At the beginning of the forum, Dr. Amany Salama, a Lecturer at the Nutrition Department spoke about the role of healthy nutrition in protecting against noncommunicable diseases (NCDs). Then Dr. Maha Abou Bakr, a lecturer in blood diseases, gave a word about anemia and that it is only a symptom not disease. The Assistant Lecturer. Nisreen Helaly also gave a synopsis of the important role of Vitamin D and why do we need it. The seminar concluded by referring to the dangerous effects of artificial food colouring additives; a topic that was highlighted in the word of the Assistant Lecturer. Heba Ragab. The seminar was held in the presence of academic faculty members and faculty students.